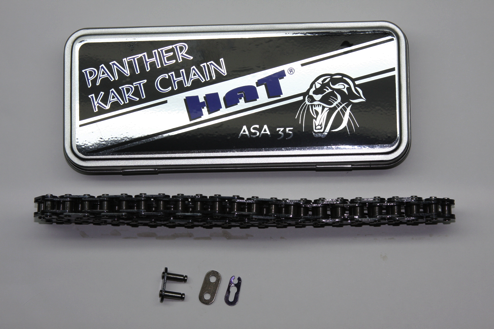 Strong, lightweight #35 chain, manufactured to with the same quality and techniques as the Panther #219 chains. This chain was designed to outlast and outperform all other chains on the market. 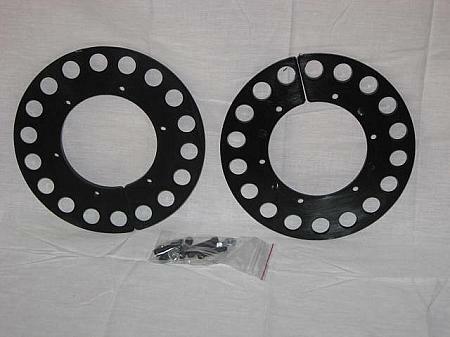 The side plates are constructed using a thicker neck to reduce stretching and overall wear. The pins are smooth and do not hold grit like many competitors, which further reduces wear on both the chain and the sprockets. Watch the video on the Panther #219 chain and you will begin to see the difference a quality chain provides in both performance and longevity. NOTE: Will only work on 12 tooth and up drive gears. High performance #35 Chain. Black/Black. Includes master link. Made in Japan. RLV Xtreme has made the ultimate in high performance Kart chain. State-of-the-art materials combined with the latest in drive system technology has produced a chain that is lighter in weight for quicker acceleration and less rolling resistance while maintaining superior strength. Xtreme chain is pre-lubricated and pre-stretched which reduces the need for adjustments. It is held to tight tolerances to make it free rolling with less drag between bushing, pin and side bar. Side bars coated for superior wear resistance and less sprocket wear. Patent Pending bushings with their angular seams is another milestone in design and function. If you are not using Xtreme, Gold on Gold, you are not running your best. Includes 4 master links. 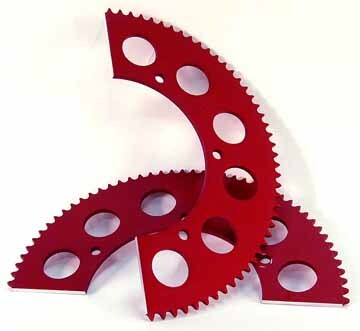 RLV Xtreme has made the ultimate in high performance Kart chain. State-of-the-art materials combined with the latest in drive system technology has produced a chain that is lighter in weight for quicker acceleration and less rolling resistance while maintaining superior strength. Xtreme chain is pre-lubricated and pre-stretched which reduces the need for adjustments. It is held to tight tolerances to make it free rolling with less drag between bushing, pin and side bar. Side bars coated for superior wear resistance and less sprocket wear. Patent Pending bushings with their angular seams is another milestone in design and function. If you are not using Xtreme, Gold on Gold, you are not running your best.